Baroness Tanni Grey-Thompson says Wales should bid to host the 2026 Commonwealth Games. The legendary Paralympian believes Cardiff's hosting of the World Half Marathon should prompt an attempt to bring the games to her home country. Cardiff staged what were then known as the Empire Games in 1958. "We just have to be a bit brave and a bit bold and go for it because the Commonwealth Games is a brilliant event," said Baroness Grey-Thompson. In July 2014, Wales' First Minister Carwyn Jones said there was no guarantee Wales would bid to host a future Games. 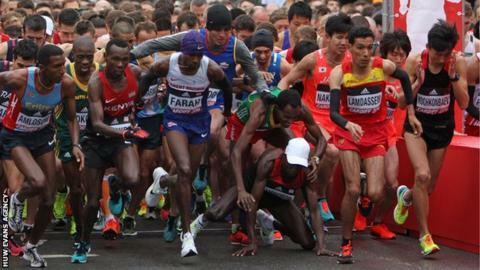 But Baroness Grey-Thompson said the half marathon won by Kenya's Geoffrey Kamworor could only help a bid. Australia's Gold Coast will host the 2018 Commonwealth Games while Durban in South Africa is the 2022 destination. Baroness Grey-Thompson says financial backing for a bid from Wales would need to be solid, adding: "A lot of the venues are already here in the south Wales area and we do know it brings in money, it brings in people, it brings in tourism." Britain's Mo Farah won bronze behind Kenya's Geoffrey Kamworor in wind and rain in the Welsh capital on Saturday and the double Olympic and world champion backed the Cardiff course. "It was fast. I'm sure Geoffrey will say the same thing," Farah said. "It's quite a fast course, even though it's got a little bit uphill. "If conditions were clear, we would definitely have seen [a time] close to a world record." Baroness Grey-Thompson said hosting the World Half Marathon Championships was "part of a stepping stone" to hosting other events. "In future years, even without it being a World Championship, there's a whole pile of runners from the rest of the UK and around the world who will see how fast this course is and will want to come and run it," she said. "So we won't always be able to measure the benefits, but actually for Welsh Athletics, British Athletics - those benefits will be there." Wales' former Olympic 400m runner Jamie Baulch backed up her view, saying: "We hosted an amazing event, the times were fantastic, the performances were there and Mo Farah was competing. "I think it's just looking on course to get us the Commonwealth Games in 10 years' time."